In the past couple of weeks a few people, who would like to start growing vegetables, have asked me which are the easiest to grow, so I thought I would write a post with some tips for first time growers. But before I do, I should point out that I have only been growing my own since I started writing this blog. I have picked up a lot of tips along the way from family, friends, neighbours, other gardeners and other bloggers and I have learned a lot through trial and error. However, I have a lot more to learn and I am by no means an expert - much more a novice with a few tips you might find useful. 1) Only grow what you enjoy eating. You will put more time and effort into a crop that you actually want to eat. 2) Speak to your neighbours. They will have the same soil type as you and if they have grown vegetables before they will be able to advise you on varieties that have done well in their garden. Not only is our neighbour a good source of advice, but having discovered that we both like growing vegetables, we have on a number of occasions shared our surplus seedlings. 3) Be realistic about how much time you will have to spend in your garden. Last year in spring, pregnant with Garden Lass, I happily sowed hundreds of seeds and filled our garden with a multitude of vegetables, only to neglect them when Garden Lass made an appearance. We didn't pot things on in time, we forgot to harden plants off before moving them outside, we went days without watering the poor things and we left the pests pretty much to make themselves at home. As a result there were many times when growing our own felt like a chore rather than a hobby. 4) Choose varieties that suit the size of your plot. For a lot of vegetables their are varieties that will do well in pots or dwarf varieties that suit smaller spaces. Collect some seed catalogues and look at how big the plant will grow and how much space you will need to leave between each plant before deciding if you want to grow it. 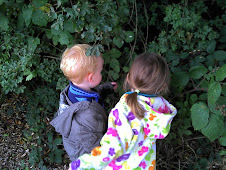 5) If you want to get your children involved sow some quick growers so they will really get to see the results. Lettuce and cress grow quickly and even if these are not your favoured crops it is worth sowing a a couple of pots to keep the children interested. Also with children choose vegetables they will get excited about such as growing their own pumpkin to carve at halloween and their own Brussells Sprouts to eat at Christmas. 6) Herbs are expensive to buy fresh and once you have grown a pot full you can harvest them on a cut and come again basis eg basil, coriander. Perennial herbs such as rosemary, oregano, thyme, sage, mint and chives are very easy so grow. You can buy small plants quite cheaply and they will quickly grow, providing you with fresh herbs year in year out with very little effort and attention. 7) Don't spend a fortune buying plant pots - you can sow seeds in toilet rolls, or punch a few holes in the bottom of yoghurt pots. Most garden centres also let people leave their used plant pots outside for other people to take away so you can always pick up a few extra pots this way. 8) Do remove pests as soon as you spot them - slugs and snails should just be removed and black fly should be sprayed with soapy water. 9) In general courgettes and squash are easy to grow and crop well. Runner Beans are also very good croppers and require little attention. Beetroot, Curly Kale, spring onions and Brussells Sprouts have always been successful in our garden. If you are growing potatoes you will get a better crop in the ground, but harvesting is far easier in a bag so if you want things that take little time grow them in a bag. 10) Have fun and if something doesn't grow well don't assume you did something wrong - there are many factors affecting how well something will grow; temperature, soil type, the weather, what is growing near by, pests, the seed variety, the quality of the seed etc. Take it as a challenge and enjoy trying to beat the problem the following year! And as always, if you have any tips yourself, let me know! Dwarf French Beans are very rewarding. A couple of years ago ours thrived despite being planted in very dry sunny stony thin soil with very little watering. In current garden in better soil they produced even more prolifically for a longer season. They are definitely worth growing - make sure you get Dwarf - much easier because they don't need any sort of staking or support. All great tips; thank you! As a newbie, I'll take all the expertise I can get! Some very sensible advice there! I'm an experienced gardener myself, but I have recently been re-inspired by A)getting into Blogging, and B)the advent of a grand-child, who has already become very interested in my gardening antics. You can see her on her Mum's blog "Mellow Mummy". Radishes are another good crop for lillte ones - they look impressive and grow very rapidly.